Whether you’re missing a tooth from accident, injury, decay, or other reasons, dental implants are the highest standard for tooth replacement in dentistry today. A dental implant is a small, titanium post that serves as an artificial tooth root. Atop this screw, our doctors secure a permanent, esthetic crown that blends seamlessly with surrounding teeth. Because they mimic tooth structure, implants can look, feel, and function like a solid, natural tooth. 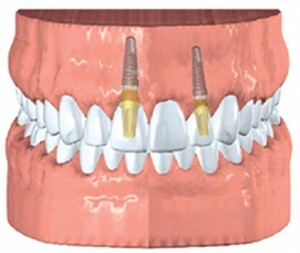 Instead of a removable or fixed bridge, many patients with a missing tooth are choosing dental implants for replacement. Implants look, feel, and function like a solid, natural tooth because they mimic tooth structure. The procedure involves placement of a small titanium screw into the jaw. Atop this screw, our doctors secure a permanent, esthetic crown that blends seamlessly with surrounding teeth. Patients can care for implants just as they do natural teeth with twice daily brushing, daily flossing, and two checkups each year. In the past, the only option for single tooth replacement was a dental bridge. Conventional dental bridges require reduction of the teeth on each side of the missing tooth. This means that natural teeth have to be compromised in order to sustain a full smile. With dental implants, your natural teeth remain fully intact, allowing you to keep a full set for longer. Once a tooth is gone, the jawbone that supported that tooth is no longer needed. As a result, the jawbone begins to deteriorate, which changes the entire facial profile. Patients with jawbone deterioration have a “shrunken” profile. A dental implant will function like a tooth root and stimulate healthy bone regeneration. Dental implants are one of the only tooth replacement options that won’t eventually result in bone loss. Another benefit of single-tooth dental implants is that with proper care and maintenance they last most people a lifetime. Traditional dental bridges will only last 7 to 10 years before they need to be replaced. Patients can care for implants just as they do natural teeth with twice daily brushing, daily flossing, and two checkups each year. For more information give the Forte Implant Center a call. Conventional dental bridge – Tooth reduction for crowns is required. Dental implant – No tooth reduction required. Tooth position: As your implant dentist, our doctors want your tooth replacement to function well with the rest of your teeth. We will make sure that the dental implant is the ideal shape and size for a properly aligned bite. Bone support: The dental implant must have adequate bone support to be successful. If it does not have enough bone, our doctors can perform a bone graft prior to or in conjunction with dental implant placement. Gums: Our doctors carefully consider the appearance of the gum tissue that surrounds the dental implant. The ultimate goal is for a natural-looking tooth replacement that appears to grow from the gum line. If there is a deficiency or excess of gum in the area, our doctors can perform a gum graft or gum lift for a more natural appearance. Cosmetics: When treating teeth in the smile zone, our doctors take a comprehensive approach to ensure a beautiful smile. Our office houses a laboratory with a master’s level ceramist who will custom design a beautiful tooth based on the information we give her. If you would like a whiter smile or smile makeover, our doctors may suggest porcelain veneers or crowns to enhance your smile in conjunction with your dental implants. If you need to have a tooth replaced and want the best available treatment, call us today or schedule a free consultation. Our doctors have over 50 years of combined experience in general dentistry and in restoring beautiful smiles, and we can help you find the best option to fix yours.